There are no backcountry campsites in the Tucson Mountain district of Saguaro National Park since it is small in area, and the longest single trail is 10 miles - well within the range of a day hike. For a comparatively small region the paths are quite varied, and lead to mountain peaks, along dry washes, to an old mine, to a group of petroglyphs, or mostly, just wind through dense growths of saguaro and other plants of the Sonoran Desert. Many trails intersect, allowing for loop hikes; the park visitor center distributes a useful map of the area that shows the various routes. The Tucson Mountain map shows the location of all trails. 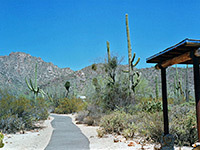 For paths in the east section of Saguaro National Park, see the Rincon Mountains hiking index. Bajada Wash 1.7 220 As the name suggests, this trail follows the dry streambed parallel to the south side of the Bajada Wash loop road (Hohokam Road), starting in the west at the Sus picnic area and meeting the road again just south of Apache Peak. 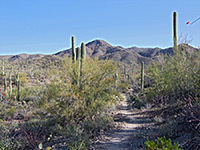 Most of the wash is surrounded on both sides by mountains so there are few distant views; instead, the path encounters the cacti and other plants typical of this region. Cactus Wren 1.5 200 Two paths lead north from the Signal Hill picnic area over gently sloping plains and dry washes near the west edge of the park, ending at the corner of Sandario and Rudasill roads, and together they form a loop of 4 miles. 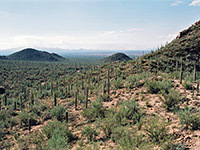 Both pass similar scenery of saguaro, cholla, palo verde, mesquite and various other cacti. The Cactus Wren Trail is the shorter, and forms the eastern half; the Manville Trail completes the round trip. Cam-Boh 2.7 140 In the northeast corner of the park, the Cam-Boh Trail runs alongside the Picture Rocks Road and links with 10 other short paths, on both sides of the road, of length varying from 0.7 to 1.9 miles, heading across flattish desert or along dry washes. All are rather close to the busy road and pass through similar scenery. They are open for equestrian use as well as foot travel, and are perhaps best suited for horses only. Horses are not permitted on most of the paths in the main (west) part of the Tucson Mountain District, where the hiking is generally more exciting. Desert Discovery 0.4 (loop) level On Kinney Road, a mile from the Red Hills visitor center, the paved, wheelchair-accessible Desert Discovery Nature Trail is the shortest and easiest footpath in the park, providing a good introduction to the plants and animals found in the Sonoran Desert. Information boards along the trail describe the most common species. Encinas 3.5 600 Leading across open cactus plains north of Apache Peak, the Encinas Trail follows an abandoned vehicle track most of the way, between the Ez-Kim-In-Zin picnic area on Golden Gate Road, and a junction with the Manville Trail near Sandario Road. Not many people hike the full length as the scenery is little changing, but the west part can be used to shorten the Cactus Wren/Manville loop, as the Encinas Trail cuts across the middle. Gould Mine 1.1 260 The path up a cactus-studded ravine to the remains of Gould Mine is just over a mile but is often combined with parts of the Sendero Esperanza and King Canyon trails to form a circular route of 2.5 miles. The mine was in use for a short time around 1900, when a small amount of copper ore was excavated, and today its location is evident from tailings piles and wooden relics. The trailhead is the same as for the King Canyon route, along Kinney Road. Hugh Norris 4.9 2,130 This is the longest trail in the park, and has the greatest elevation gain. It climbs up a short steep canyon then follows a ridge of increasing height all the way to the summit of Wasson Peak, for unsurpassed views of the surrounding mountains and desert. King Canyon 3.5 1,790 One of two routes to the highest summit in the Tucson Mountains (Wasson Peak), this well maintained trail begins on Kinney Road just south of the park (opposite to and 0.1 miles from Arizona-Sonora Desert Museum) and heads northeast up Kings Canyon, climbing quite gently along an old vehicle track for a mile to the Mam-A-Gah picnic area, and a junction with the Sendero Esperanza Trail. The gradient is rather steeper at the head of the canyon, as the path ascends to a ridge running south from Amole and Wasson peaks, where the Sweetwater Trail joins from the east. The final 1.2 miles is along the ridge, past some old mine workings, to an intersection with the end of the Hugh Norris Trail, then a final 0.3 miles to the summit. Manville 2.5 200 The Manville Trail climbs gradually from the junction of Sandario and Rudasill roads to the Signal Hill picnic area, where it meets the Cactus Wren Trail to form a loop; both pass through typical Sonoran Desert scenery. Most is close to the road and so within range of traffic noise. Sendero Esperanza 3.1 750 The Sendero Esperanza Trail passes flat cactus plains, rocky ravines, a high ridge and an old mine, and links Golden Gate Road in the north with the King Canyon Trail in the south, meeting this route at the Mam-A-Gah picnic area. The northern trailhead is opposite the Ez-Kim-In-Zin backcountry picnic area, from where the first 1.7 miles is along an old vehicle track, then a short, steep ascent up to the top of a ridge, and a junction with the Hugh Norris Trail. On the far side is a longer but gentler descent, past Gould Mine and into King Canyon, 0.9 miles from the main road. Like most paths in the park, the various intersections means that combinations hikes are possible; one option is to use the Sendero Esperanza Trail to reach Wasson Peak via the upper part of the Hugh Norris route, a trip (one-way) of 3.9 miles. Signal Hill 0.2 50 Signal Hill is a small, bushy summit crowned by boulders coated with desert varnish, into which are etched many petroglyphs dating from the Hohokam period of the 13th and 14th centuries. 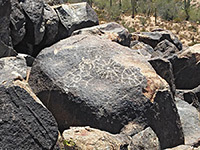 The hill is surrounded by flat desert so makes a good vantage point for photographing the wider landscape, as well as the petroglyphs. 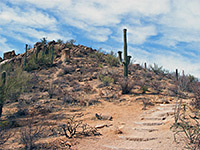 The path to the top starts from the Signal Hill picnic site, at the end of a short spur road off the north part of Hohokam Road, and 5 miles from the visitor center. Sweetwater 3.4 950 From a trailhead on the east edge of Saguaro National Park, at the end of W Camino del Cerro (5.7 miles west of I-10 exit 252), the Sweetwater Trail follows a ravine for most of its 3.4 miles, climbing up to a narrow ridge running southwards from Wasson Peak, where the path joins the King Canyon Trail. Kinney Road is 2.3 miles further, allowing for a walk across the whole park of less than 6 miles, though a car shuttle would then be required. The east facing slopes make the Sweetwater Trail a good location for photographing the sunrise. Valley View Overlook 0.4 30 Along the one-way portion of Hohokam Road, this short path crosses a dry wash and climbs to the top of a small ridge running southwest from Apache Peak, for superb views in all directions, especially north, over vast saguaro-covered plains at the edge of Avra Valley. Wild Dog 0.9 230 The little-used Wild Dog Trail crosses a particularly fine section of the desert within the Hohokam Road loop. The north end is opposite the side road to Signal Hill while the southern trailhead is the same as for Valley View Overlook - from here the Wild Dog path climbs to a low ridge at the side of Apache Peak, for similarly excellent views of Avra Valley, then begins a steady descent through dense vegetation to the far side of the loop road.